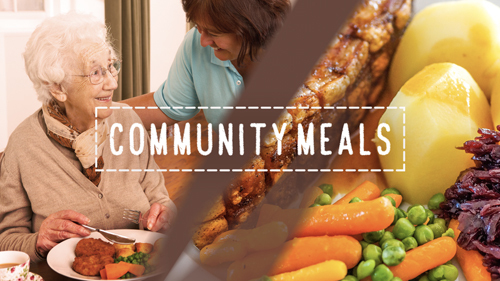 We deliver hot meals to the local community all year round, it is available for anyone, and is particularly helpful in supporting older, disabled and vulnerable people living in their own homes, who are not able to cook for themselves. This service used to be known as Meals on Wheels. We cover all of South Gloucestershire including Badminton, Bradley Stoke, Chipping Sodbury, Charfield, Filton, Frampton Cotterell, Hanham, Hawkesbury Upton, Kingswood, Longwell Green, Mangotsfield, Patchway, Rangeworthy, Severn Beach, Thornbury, Winterbourne, Wick, Yate and all the area in between, as well as a few neighbouring towns. All our meals are nutritionally balanced and our hot meals include roast dinners, casseroles, chicken pie and beef stew. Each meal comes with fresh vegetables, potatoes and a dessert, and is delivered daily up to seven days per week. Cold meals are also available which include sandwiches, cake or yoghurt and fresh fruit. We can provide for most dietary needs such as diabetic, gluten free and vegetarian meals. We can also provide a variety of meals to meet religious and cultural needs, such as Kosher, Caribbean and West Indian, Asian Halal and Asian vegetarian meals (additional supplement may be payable). Helping you to live independently at home. As part of our service we will also do a welfare check during every visit. This can include putting your meal on your plate, cutting up food and fetching cutlery. We will also check that the person is comfortable and can get in touch with their designated named contact if there is a problem. *£3.40 for a cold tea meal – which can only be ordered in addition to the lunchtime meal (not available on its own). Payment is made by direct debit or a monthly invoice (by special arrangement only). To cancel a meal please speak to your driver or telephone 01454 865996. Meals need to be cancelled before 10.00 am the day before so not to incur a charge. For a further discussion about the service and your needs please do get in touch on 01454 865996 (office hours 8.30am to 2.30pm Mon-Fri, voicemail service outside of these hours).